We are engased to offer wide range of Mobile Toilet for Tourism. We have wide range of mobile toilet which used in tourism. Apart of this we offer our products in market with affordable price and low maintenance. 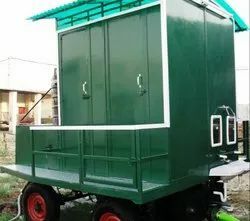 We are manufacturing and supplying Mobile biotoilet Van. These are designed using optimum quality raw material and are widely used in various public and private sectors. It can be used for construction sites, melas, temporary camps etc. It is available in various sizes from single seater to 20 seater. There type of bodies are need to transport good at different temperature they may be 2, 3 or 4 compartment may vary from + 50 C to -20 C there compartments have individual doors / entries movable bulkheads can be used for better space managements. And a best useful for city distribution to various points. Available with us is pristine Bio Toilet Van, which is designed using high grade raw material. Easy to use, these mobile lavatories can be conveniently cleaned and maintained. Owing to their remarkable features such as light weight, sturdy construction and systematic drainage system, these vans are suitable for various occasions and social gatherings. We are dealing into only 10 seater. 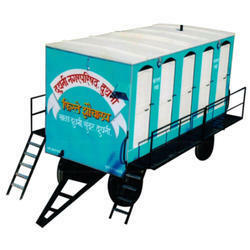 We are the leading manufacturer and supplier of Mobile Toilet Van in india. These are manufactured from high grade raw material and state of the art technology. No. Of Compartments: 10 no.